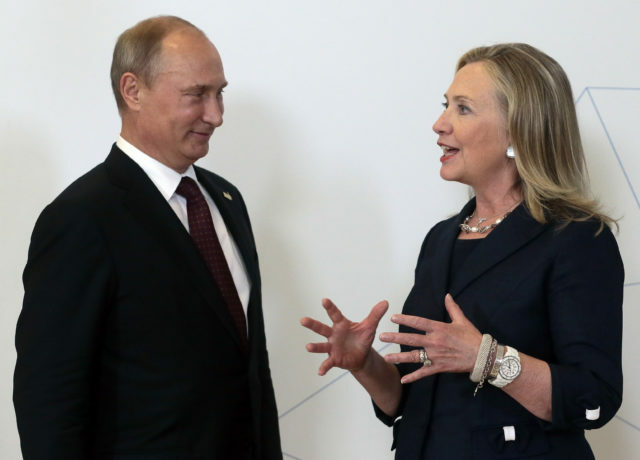 The mismatch between an ideological Clinton and an opportunist Putin is fraught. Clinton has spoken many times about the need to undermine and contain dictators…. The mismatch between an ideological Clinton and an opportunist Putin is fraught. Clinton has spoken many times about the need to undermine and contain dictators….It’s easy to agree with this “democracy good, dictatorship bad” approach, but harder to imagine what it will mean in practice. Using words to explain national security missions was my day-to-day mission: in crisis, to explain changes in foreign policy; in rare moments of calm, to share the stories of America’s intelligence officers and military service members…. [C]larity and consistency are the coin of the realm when you need to articulate the position of the United States on issues such as nuclear proliferation, global terrorism, and cybersecurity. Donald Trump is neither consistent nor clear and that makes him dangerous…. Trump said earlier this year that when he seeks foreign policy advice, first “I’m speaking with myself, number one, because I have a very good brain.” That’s code for “I wing it.” You cannot wing it when you’re looked to for global leadership. Republican presidential candidate Donald Trump makes remarks before the second presidential debate with two women who have accused former president Bill Clinton of sexual assault. 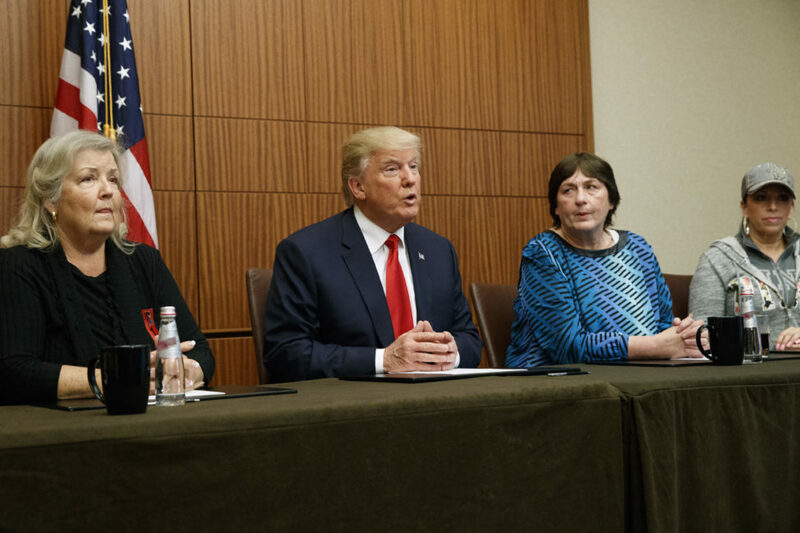 From right, Paula Jones, Kathy Shelton, Trump, and Juanita Broaddrick. Shelton alleged she was raped at age 12 by a 41-year old man who Hillary Clinton was assigned to defend. Oct. 9, 2016, in St. Louis. The most coherent section of the debate was, rather surprisingly, on foreign policy. 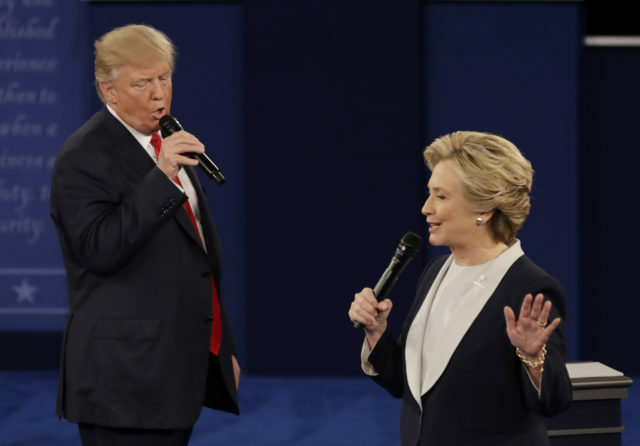 Unfortunately, it was still a comprehensive disaster — from the choice of question to the answers from both candidates. As for the actual Syria question, Trump’s bizarro instincts often serve him best in foreign policy, and as usual he stumbled onto one decent line of argument here. This time he rightly criticized the U.S. tendency for arming rebel groups to go awry….But this was drastically undercut by Trump’s subsequent argument that because Syria’s Bashar al-Assad and Russia are (together with Iran) fighting ISIS, the U.S. should effectively align with that faction to defeat the common enemy. Clinton, for her part, erred in the other direction, displaying her usual hawkishness by suggesting a no-fly zone is needed in Syria, and arguing America should start arming Kurdish forces. The Kurds have been very reliable proxies, but they need help with engaging Turkey diplomatically more than they need weapons, and a no-fly zone risks inciting further Russian escalation. Who Flunked the Commander-in-Chief Test? Trump said “I will knock the hell out of ISIS,” seemingly unaware that 45,000 ISIS fighters have been killed in the past couple of years by the US-led coalition, according to US Army Lt. General Sean McFarland, who was in charge of that coalition until two months ago…. ISIS now has a serious math problem because the attrition rate from US air strikes is vastly more than the group’s capacity to attract new fighters…. She also claimed she “would not use American ground forces in Syria,” which is something of a distinction without a difference since US Special forces are fighting in Syria already.